TAKE ACTION to show the world how Israel makes the world a better place. We need you to get the word out, get your communities involved, and get our message heard across the country and around the world. Choose from the list below and take action to change the conversation about Israel. Write a letter to your Congressperson: Using our draft letter, send a letter to your congressperson telling them about how Israel makes the world a better place and that they should promote the conversation about a positive Israel. 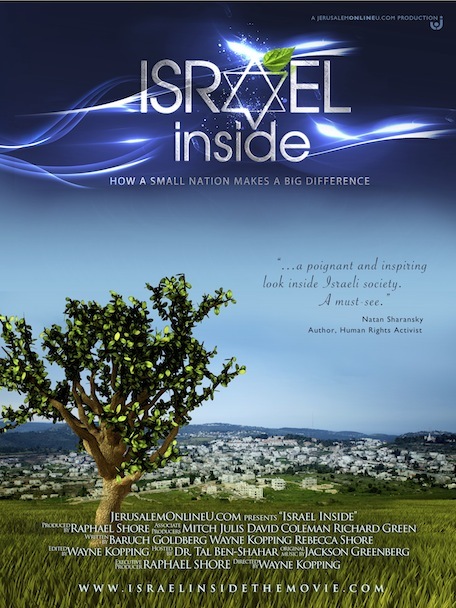 Host a movie screening: Israel Inside, hosted by former Harvard lecturer Dr. Tal Ben Shahar, examines the core character strengths that have enabled Israelis to overcome challenges and turn a barren desert into a flourishing nation. Celebrate 64 years of miracles and splendor together with the State of Israel and screen the new hit feature film Israel Inside at your home, synagogue, or campus. Educate your neighbors: Placing pamphlets around your neighborhood about all of Israel's achievements is a great way to change the conversation about Israel. Order your doorhangers today and spread the word about how Israel is making the world a better place. Invite a Speaker: We offer a wide variety of speakers who are well-educated on the positive effect Israel has on the world. Book a speaker to come to your home, synagogue, or campus today! Buy Goods, Support Israel: Show Your Support and Save! Benefit from exclusive savings from JNF partners who support Israel. Keep checking back for new offers.